Baofeng, Chinese video player and online video provider, has re-filed for IPO on Shenzhen Growth Enterprises Board (GEB). The company filed once in April 2012 but didn’t manage to go public before October that year when Chinese government banned IPO — IPOs were allowed to resume earlier this year. Baofeng management also said before that they had plans to go public in the US. Founded in 2003, Baofeng started up with a desktop video player. Video streaming would become its major offering. The company makes revenues from advertising, premium subscriptions and gaming. But more than 99% of the revenues in 2012 and 2013 was from advertising: pre, mid and post-roll video ads and display ads. Different from other online video services such as Youku-Tudou, Baofeng has been profitable. The company saw a decline in net profit in 2013 because of increased spend on video rights, according to the company. Baofeng and Xunlei, which recently re-filed for IPO on the US, have a lot in common. Both began with video software about a decade ago and have been technology-driven companies. And later both had to start offering online video streaming to keep up with the trend. What’s interesting is the two companies adopted different monetization approaches. While Baofeng makes the majority from advertising, Xunlei makes the larger part of the total revenue from paid subscriptions. 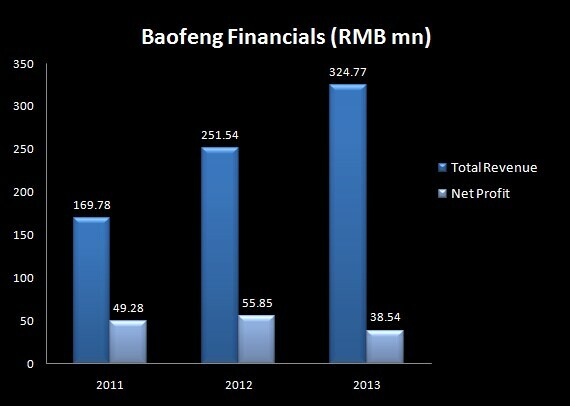 Baofeng raised three rounds of funding from investors including IDG Capital and Matrix Partners China in 2006 – 2008.